Price is $220 per person with a minimum of 2 people to run a tour. 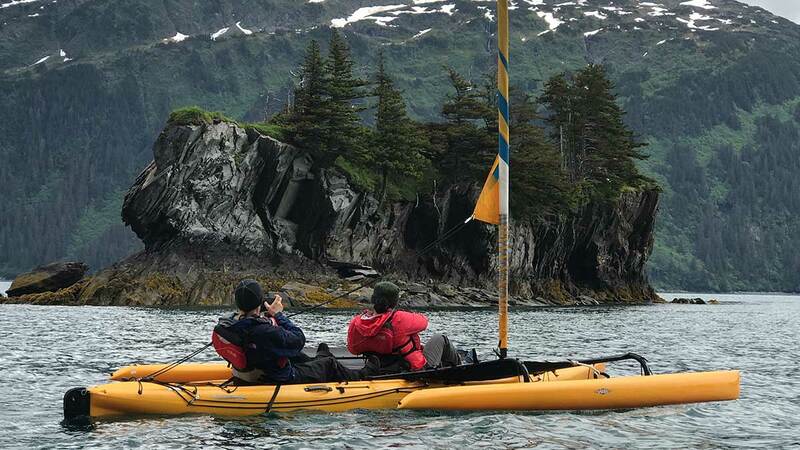 This tour departs daily at 1:30pm and sails 7.5 miles around Passage Canal in the Prince William Sound just outside of Whittier. We’ll sail the South shore of Passage Canal enjoying beautiful rock formations and waterfalls while keeping our eyes peeled for bald eagles, seals and other marine life. Then we’ll cruise around Emerald Island and on into the cove to search the crystal clear water for sea creatures as we slowly drift through. This little cove is a real beauty and will take your breath away! 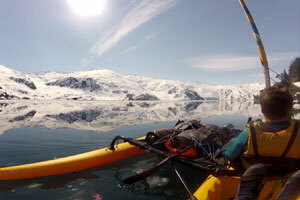 After we’ve enjoyed this little wonder we’ll cruise back along the south shore into Whittier. 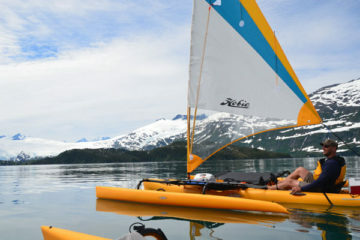 These extremely stable sailing kayaks and the four hour tour duration is ideal for folks looking to get a taste of something unique as well as for young travelers! If the wind is not in our favor there’s no need to worry. The boats have adjustable pedals that can accommodate many sizes, be it a 4 foot child or a 6+ foot adult. Two pontoons with a spanning trampoline allow for more room to move as well as reduce spray when under sail. The roller-furling sail is easy to operate and does not require any prior sailing experience. Your tour will include NRS dry-bibs and a splash top to help keep you dry and warm, a life jacket and an experience guide. 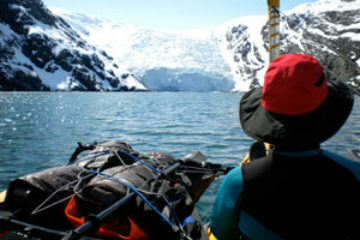 The departure and return time of this tour is ideal for train travelers. The Alaska Railroad has a daily train that arrives into Whittier at noon and departs at 6:45 making for easy travel to and from Whittier. If you are interested in booking a train ride give us a call and we can help you arrange tickets.